A quick thank-you is due to all of the attendees to our May 2017 LS-DYNA training. The five day class focused on building accurate nonlinear transient simulations. The learning process was based on workshops covering how one could take basic data (e.g.,engineering stress-strrain) and geometry and then create an advanced simulation that could be verified and taken forward to validation with confidence. Best practices were advocated from mass scaling, element formulation (elform=-16) to MORTAR contact to encourage the students to first get a model that would run and then later on optimized it for numerical efficiency. 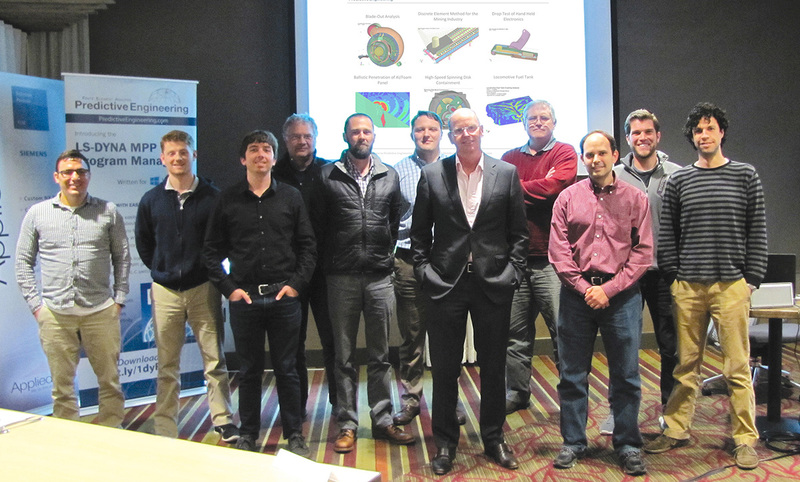 The last day of the class focused on LS-DYNA's rapidly evolving implicit capabilities. Our next LS-DYNA training class will be May 14 - 18, 2018. Below is a condensed presentation of our paper "A Roadmap to Linear and Nonlinear Implicit Analysis in LS-DYNA" that we presented at the 11th International LS-DYNA User's Conference in Salzburg, Austria on May 9-11, 2017. Here's the Abstract: The default LS-DYNA settings are tailored for running large explicit analyses. For new and even experienced users, it can be challenging setting up an implicit LS-DYNA analysis to match analytical solutions or other standard implicit FEA codes. For example, the default element formulations are based on single-point integration whereas implicit analyses benefits from full-integration. A series of example problems are provided that will allow the simulation engineer to exactly match industry standard implicit codes (complete keyword decks can be found at DYNAsupport.com). Along with these example decks, CPU-scaling results will be presented for each implicit analysis type from linear to nonlinear. We hope you enjoy it as well as our soundtrack selection. Predictive Engineering has been offering mechanical engineering analysis services for more than twenty years. We have over 800+ successful projects to our credit. Our work has been strain gauged, drop-tested, benchmarked, validated, proof tested, shaker-tabled and implemented in hundreds of designs. We have optimized structures from deep-diving submarines, tail rotor blades on a Sikorsky Helicopter, high-temperature hydrogen reactors, composite antenna systems, 3,000 HP transmissions, NQA-1 nuclear waste processing vessels to R&D satellites for the US Air Force. Additionally, we have extensive experience with LS-DYNA over the last 15 years and have done projects on: projectile impact, pyro-shock detonation, fracture of ductile and brittle materials, drop-testing of composite structures, electron-beam welding and impact of metal, plastic, elastomer and foam structures. Least we be too technical, we have also successfully modeled the shaker-table transport of French fries using the discrete element method (DEM).